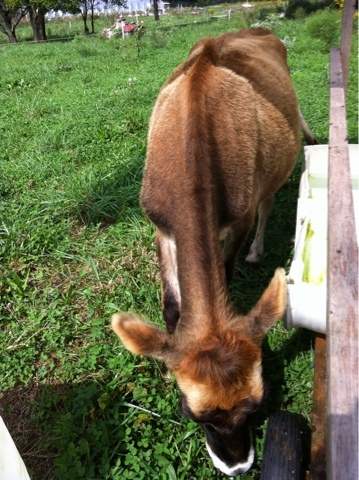 Our goal here is to grow beautiful greens for all the livestock to eat. We began with vines, small shrubs, tons of the non-native Queen Annes Lace. At least a quarter of the pastures has changed dramatically. We have not seeded or added any fertilizer or herbicide. Homer has moved the animals about, with quick visits that last a day or less. This area has converted over to clover..and the cattle and the honeybees both love it. Not certain why the Queen Annes Lace has vanished. Something to do with the ph change I'll bet. Last year it was everywhere and now we have the small flowered, native, 5 foot tall asters everywhere. I am loving how this looks!